We offer classes in a variety of aerial arts and aerial fitness. The Bird's Nest instructors are trained in the art of aerial dance and can teach you how to bring grace, beauty, and flair to your practice. In our main space we have 8 points professionally rigged for maximum safety to our 20-foot ceiling. Choose your favorite apparatus and join us! Silks or aerial fabric consist of one long piece of fabric with two tails that can be spread out or held as one or two poles. The dancer wraps the fabric around their limbs and torso to create beautiful shapes and dramatic movements. A lyra is a metal hoop, usually wrapped in tape and suspended by either one or two points. 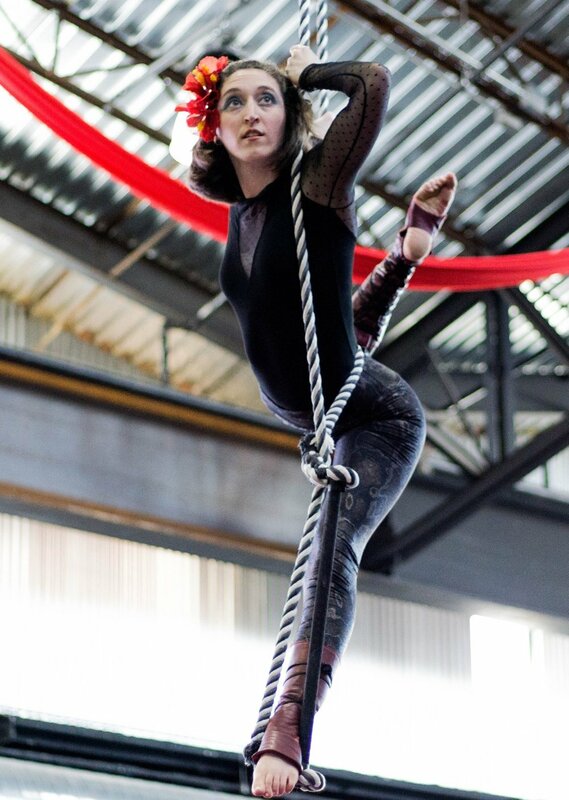 The performer often uses momentum to keep the lyra spinning while move through poses. We teach classes with a low-hanging dance trapeze, a horizontal bar with two ropes hung on one point to allow rotation. The artist uses both the bar and the ropes to support their body as they dance gracefully in the air! Please do not use lotion prior to class, remove all jewelry, and wear tight fitting clothing such as leggings, leotards, tight fitting tee shirts, tanks or long sleeves. These classes are taken in barefeet, although in Lyra grippy yoga socks are also permissible. Pre-requisites apply for Intermediate Level classes.